AKIJ Group, a sole proprietorship company one of the leading industrial group in Bangladesh. Initially it started with trading business in a humble way in early 1940 by Late Sheikh Akijuddin and later on he involved himself into manufacturing of hand made cigarette (BIRI) & Jute business in 1950. He worked diligently with honesty, punctuality, loyalty & ethics through out his whole life. As a result, the founder of Akij Group successfully diversified into various industrial & commercial units under one umbrella to convert it into a large conglomerate under his dynamic leadership. Akij Group contributed and committed to CSR by establishing Schools, Colleges, Madrasah, Mosques, Orphanages & Medical College Hospitals etc. Now the main business includes manually made cigarettes (BIRI), Jute, Leather, Foot wear, Textile, Tobacco, Cigarette, Safety matches, Particle & Hard Board, Food & Beverage, Ceramic, Cement, Printing & Packaging, Securities, Crocodile Farming, Computer Hardware & Software, Chain of CNG refueling stations & Automobiles. AKIJ Motors gathered a vast experience in transportation & automobile servicing through maintenance of our own fleet by manual servicing since long. Subsequently we have established "Akij Motors" which is "One Stop Automobile Solution" to cover most of the automobile business in Bangladesh. Akij Motors is working with those vehicle manufacturers who are manufacturer some of the world renowned brands. 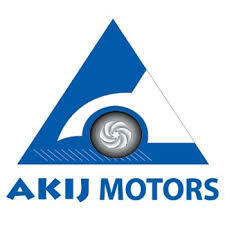 Our vision is mobility and powerful Bangladesh, powered by "Akij Motors" & "Car for all" "???? ???? ????"